Nissan Motor Co. Ltd., has inaugurated the Nissan Advanced Technology Centre (NATC), its latest state-of-the-art R&D facility, located in Kanagawa prefecture, Japan. NATC will spearhead innovations in environmental and safety technologies, allowing Nissan’s vehicle development engineers to work more effectively in one centralised facility. “NATC has been established to accelerate the research and advanced engineering of breakthrough technologies for Nissan’s next generation products. Future technologies being developed are aimed at environmental sustainability and towards creating a safer mobile society,” said Mitsuhiko Yamashita, executive vice president, Nissan Motor Company. 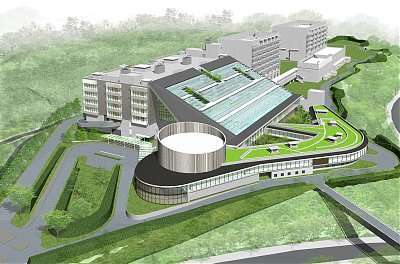 “The centre will focus on environmental technologies to fulfill the goals set out under the Nissan Green Programme 2010 mid-term action plan and beyond,” added Yamashita. At NATC, Nissan’s engineers will pursue a range of technologies to address the challenges of CO2 reduction including electric vehicles, hybrids and plug-in hybrids. Nissan has also pioneered the Intelligent Transportation System under the SKY Project where data received from traffic-beacons is used to alert drivers and help reduce potential road accidents. More “world-first” technologies such as the Distance Control Assist System, Lane Departure Prevention and Around View Monitor are being developed. NATC is more evidence of Nissan’s long-term investment vision. Nissan has recently opened its new global design centre in Atsugi and is now constructing its new global headquarters in Yokohama as well as the new headquarters for the Americas in Nashville, Tennessee. The new facility will host 2,000 employees. It will feature an Advanced Vehicle Lab and Electric Powertrain Laboratory. Nissan’s investment in NATC including several R&D and upgrade projects total 90 billion yen (AUD 833 million). This investment includes renovations to the existing powertrain development centre and construction of the global design studio, both located at the Nissan Technical Centre (NTC). The architectural concept of the NATC was designed to enhance communication and facilitate greater collaboration amongst the various R&D teams to promote a culture of cross-functional innovation. This “open” concept promotes collaborative efforts with external engineers from the supply base or visiting academics and researchers. Examples include “collaboration rooms” fitted with vehicle-lifts that can accommodate up to 200 people. The facility interior features a unique stepped-architectural design for an unobstructed view of the activities going on in the vehicle pit-lane on the first floor of the building. Attention was placed on energy conservation and minimising CO２ emissions in the design and operation of the building. The new facility is expected to be accorded the highest “S” ranking under the Comprehensive Assessment System for Building Environmental Efficiency (CASBEE). Nissan has two other major facilities based in the Kanagawa Prefecture for product planning, R&D and advanced development - the Nissan Technical Centre (NTC) in Atsugi and Nissan Research Centre (NRC) in Yokosuka. By 2009, Nissan will relocate its global headquarters to Yokohama City. The combined presence of Nissan’s Yokohama engine plant, Oppama manufacturing plant, the newly upgraded NTC and all-new NATC will reinforce Nissan’s historical legacy in the Kanagawa Prefecture. Nissan is dedicated to cultivate a mutually-successful partnership by contributing positively to the economic and community development of Kanagawa.